Can you get intoxicated by pouring beer or wine into your sauce or stew? This question is important if you are pregnant, have to drive a car or want to track calories. 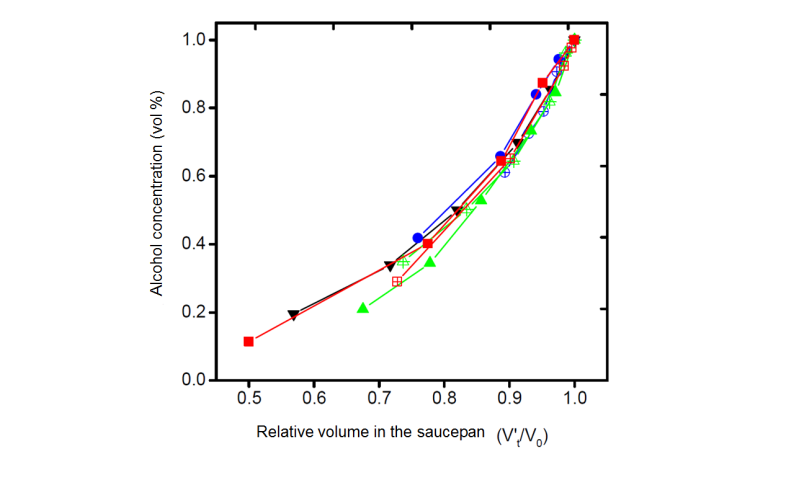 New research from the University of Copenhagen and the Carlsberg Research Center creates a model for how alcohol disappears from a sauce or another liquid dish cooked in a saucepan. This model can thus be used to control the alcohol content. Postdoc at the Department of Food Science at the University of Copenhagen Pia Snitkjaer has carried out a series of experiments with alcohol in liquid dishes to figure out how to control the alcohol content during cooking for the benefit of large kitchens, the food industry, the gastronomy and restaurant sector as well as in the kitchen at home. 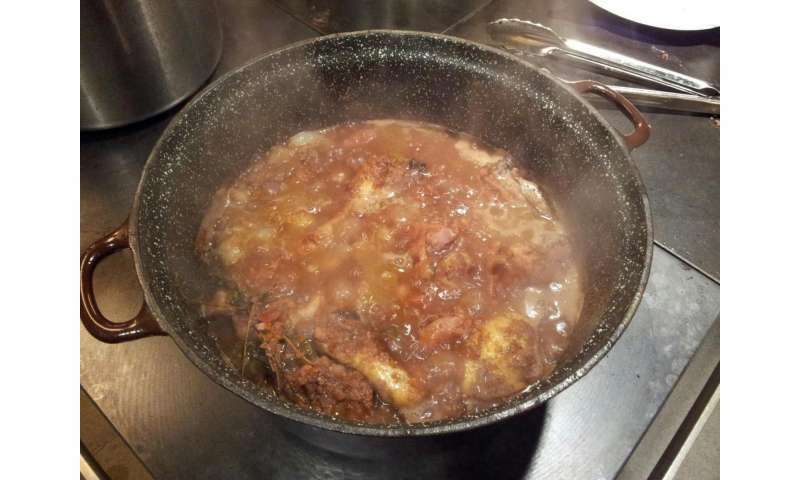 "In the experiments I used 900 ml veal stock plus 150 ml beer or wine. At this mixing ratio, the alcohol concentration starts at approx. 2 %, but drops to 0.2% after a half an hour of cooking," explains Pia Snitkjaer, who underlines that this example is based on wine. Precisely how much alcohol is left in, for example, a red wine sauce depends on three factors that you need to check if you want to control the alcohol content in a liquid dish or sauce, namely how much the dish is reduced, whether it is cooked with or without a lid and how much alcohol is added from the start (more about this in the facts section below). "One should remember that you typically eat only 1/2-1 deciliter of sauce. If we, for example, assume that you eat 100 ml sauce, with a concentration of 2 vol % it corresponds to an intake of 2ml of alcohol. There are 15 ml in a unit of alcohol, so a pregnant woman would also be able to handle it," explains Pia Snitkjaer. All other factors the researchers studied - including the dimensions of the saucepan and the cooking temperature - proved to only be significant because they could affect how quickly the sauce was reduced. Using elementary physical chemistry, which has to do with understanding the volatility of alcohol when mixed with water and heated, Associate Professor Jens Risbo from the Department of Food Science at the University of Copenhagen has developed a model that shows how the alcohol behaves in liquid dishes. That it is the volume of the dish that is the best parameter for determining the alcohol content - and not the cooking time - matters in relation to which techniques you can use if you want to reduce the alcohol content in the finished dish. "You can reduce the alcohol content quickly by bringing a dish to a rolling boil, because by boiling hard, the volume will also decrease rapidly. But if you do not want the food to boil down too much, you can keep adding water as water evaporates, which will also lower the alcohol content both by dilution and evaporation," says Pia Snitkjaer. If you want to reduce the alcohol content, you can put the lid on the saucepan. "By placing a lid on the saucepan, there is a kind of reverse distillation where the alcohol disappears even more rapidly from the saucepan than the water. This is because alcohol is more volatile than water and thus can more readily evaporate. This is the same effect you use when you distil alcohol - you heat it up, so the alcohol evaporates more than the water, after which you can condense the vapours and obtain more concentrated alcohol," explains Pia Snitkjaer. The lid does not sit tightly on the saucepan, allowing the steam escape under the lid so that the alcohol evaporates, while the water condenses more preferential on the colder lid and runs back into the pan. As it cooks, more and more alcohol escapes under the lid, while the contents of the saucepan will contain a higher percentage of water. Experiments show that the use of a lid has a dramatic effect on obtaining a low concentration of alcohol. The study has an impact on the calculation of the calorie content in recipes. Alcohol contains a lot of calories, but will probably be listed in a recipe with the calorie content the alcohol has as an ingredient before it is actually added to the dish, which results in a misleadingly high result. "How many fewer calories there are depends on how much alcohol is evaporated. 1 gram of alcohol gives approx. 7 calories, so every time you evaporate 1 gram of alcohol, you have 7 fewer calories in the saucepan," explains Pia Snitkjaer, who plans to develop the model to make it even more practical. "It would be nice to be able to say precisely what this means for a tomato soup, a meat dish, etc. There are many things that can vary the result, but you can get some ideas about what happens when some of the most important parameters are changed - for example, what happens if you have a lot of sugar or a lot of gelatine, like in a veal stock," says Pia Snitkjaer.